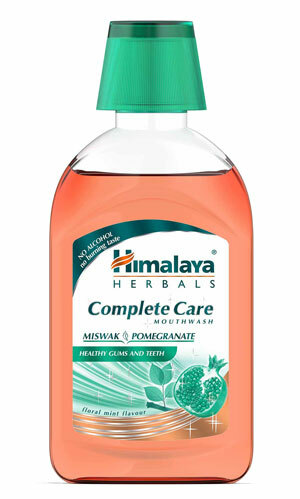 Specially formulated with an active combination of Neem, Pomegranate, and Miswak, Himalaya Complete Care Mouthwash provides complete protection to strengthen teeth and gums. It kills 99.9% of bacteria, giving long-lasting fresh breath. Providing up to 12 hours of protection from germs, our mouthwash also prevents plaque build-up and maintains cleaner, fresher, and healthier oral hygiene. Himalaya Complete Care Mouthwash contains no alcohol and does not cause a burning sensation post use. It is clinically tested. Fill cap with 15 ml of mouthwash, rinse thoroughly and expel after 30 seconds. Do not swallow. For best results, use after Himalaya Complete Care Herbal Toothpaste twice daily.